For however much I love a big blowout of a party, I think it’s important to know how to throw a low-key affair as well. If all you throw are perfectly styled, over-the-top shindigs, you probably won’t be invited to many spur of the moment “let’s just order Chinese” last second get-togethers. Let’s face it, when it comes down to it, getting together with people in any kind of environment is more important than the perfect party. That being said, you can satisfy your need to create a fun atmosphere without making it too intimidating for a mellow gathering. Every month a group of our friends plans a dinner on Tuesday nights at rotating houses. It was our turn to host and we were ordering (not making! See? Mellow!) in Italian food. 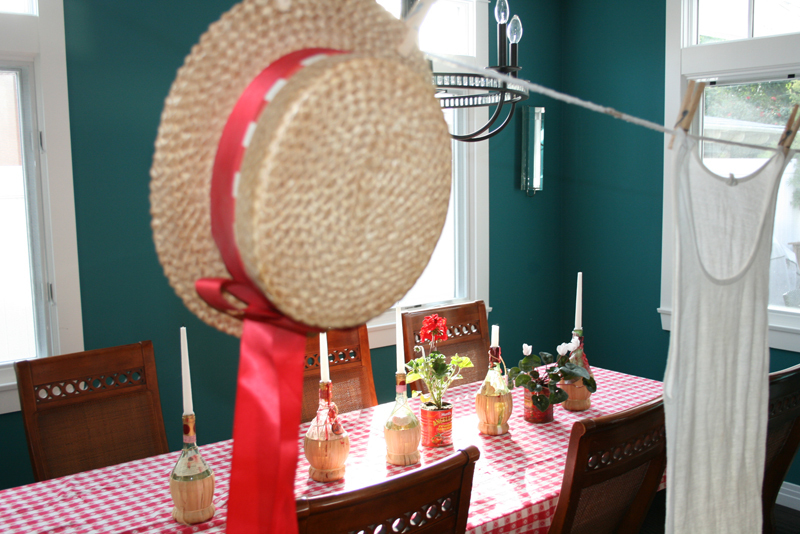 To make things a little more fun, I threw red & white checked tablecloths, (a great buy! 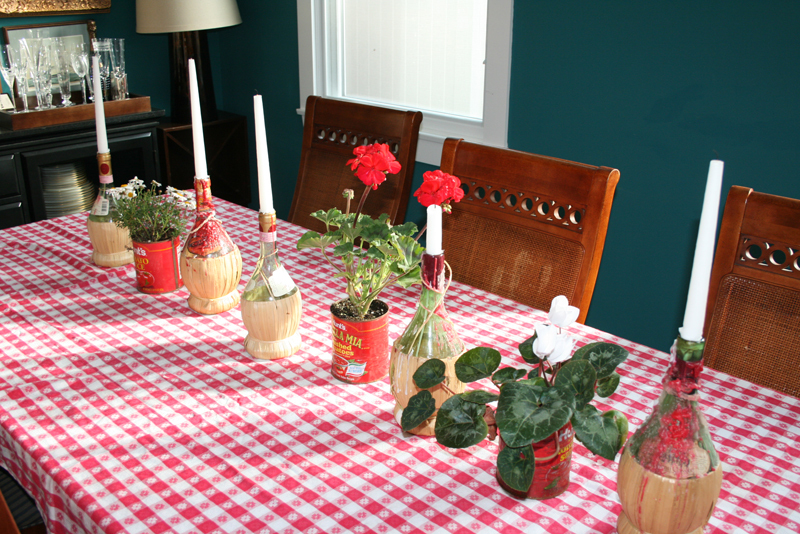 Think Italian night, picnics, even Christmas. Get them! You’ll for sure use them! 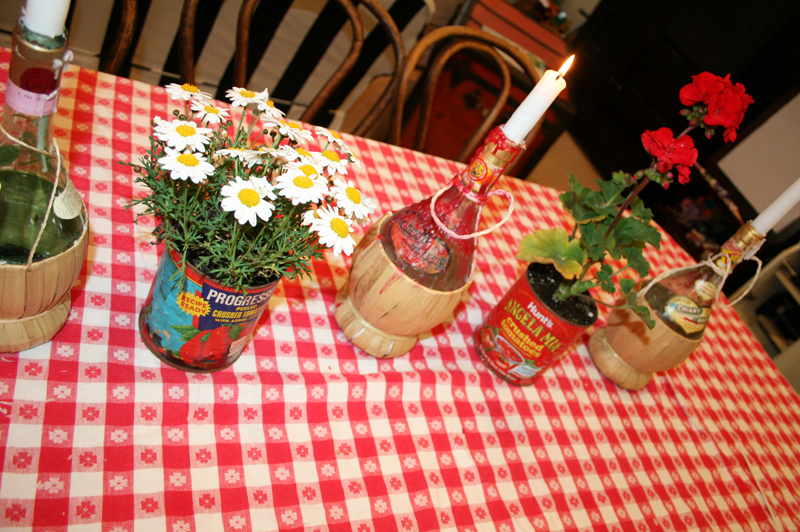 ), raffia-wrapped chianti bottles & candles, and tomato cans with flowers in them on the tables. Notice there are no plates, napkins, or utensils on the table. Those were all up by the food. People took what they needed and ate where they wanted to. 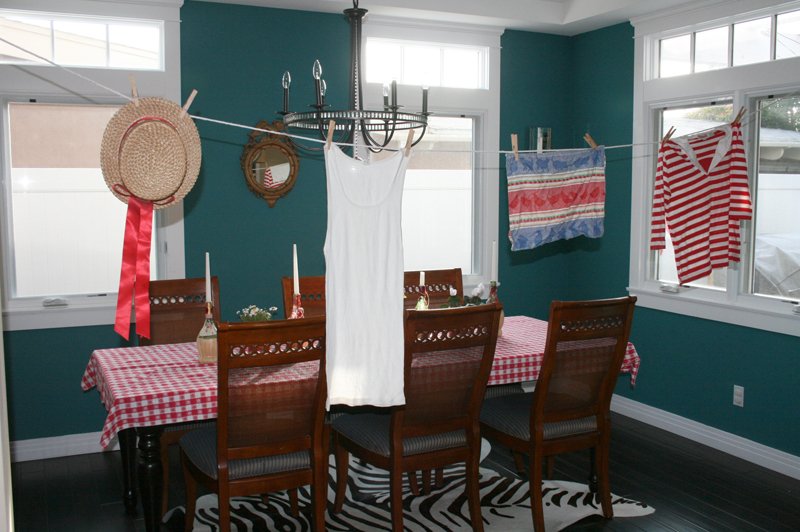 An extra detail was the clothesline. Go through your closet and grab items that read Italian. I have to admit, this collection of stuff is about 25 years old. My mom had an Italian party that long ago and has kept it in her party pack that long. But you can recreate very easily. 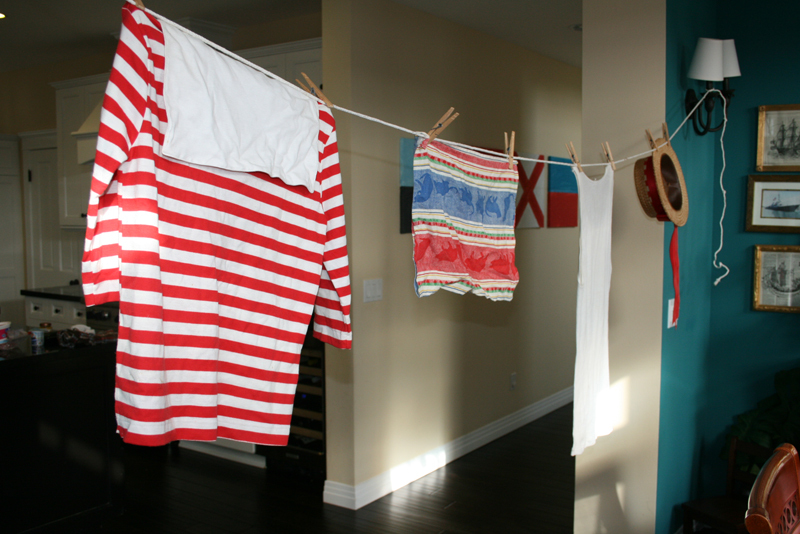 Red & white stripes, a tea towel, a wife beater, (gondolier hat not necessary, but in the off chance you have one, go ahead and add that too!) If you are thinking to yourself, “Uh, yeah right that’s easy.” Think in steps. 2. Start drinking chianti and save the bottles. Even one bottle would be cute at a small get-together. Then add a candle. 3. Plan to make something that requires canned tomatoes. Make Lasagna the day before and save the cans, then you’re all set! Just add plants! I like daisies and geraniums but I ran out of those so I just grabbed a cyclamen from our yard for the last can. Whatever you have, just use! You don’t need to buy anything! Just repot what you already have! So really, it IS easy. AND mellow. It just looks a little more exciting than your typical low-key get together but it won’t alieniate people who don’t really like to fuss with parties. 5. If you have the space, SAVE all of this! 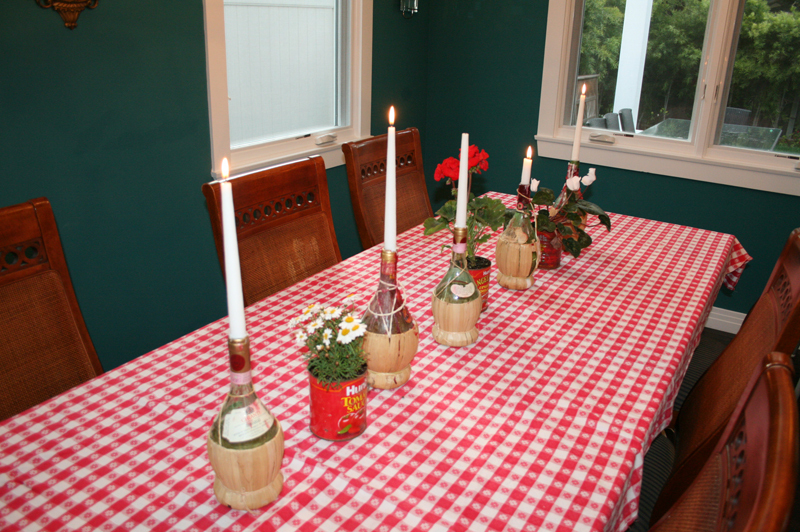 You can add cans and chianti bottles as you throw these parties and each time you host, it gets easier and easier! The number one thing is to just do it… host your friends. If something like this doesn’t seem fun for you, don’t even try it! Just have people over. No one really cares what your house looks like. They just want to spend time with you! But if you want a little extra umph for a mellow night in, give it a go! And come on? Who doesn’t like “drink chianti” as a homework assignment to prep for a party!? This entry was posted in parties for grown ups, party mellow and tagged chianti candle bottles, italian night, italian party, tomato can flowers by Annika. Bookmark the permalink. Sus! Thank you so much for this! You made my day!